Trainees learned that fire extinguishers are heavy, and to never leave the site of a fire with their backs turned. It makes sense, fire being hot, spontaneous and all. 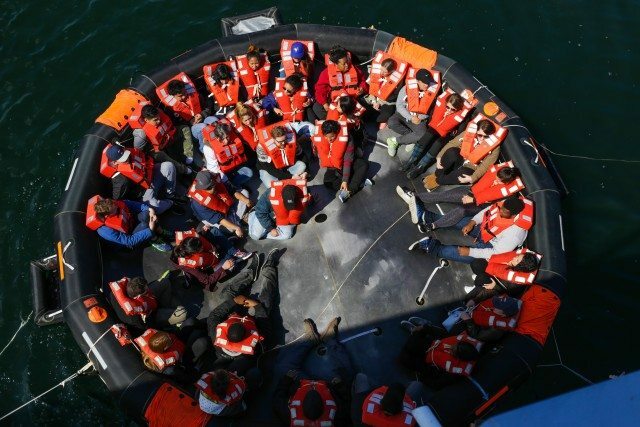 Instructed by the Toronto Police Marine Unit and Toronto Fire Services, more than 200 cruise ship employees—mostly university students—learned how to work as a team in emergency situations at Cherry Street’s cruise ship port last week. Gone are the days when “all hands on deck” meant panic. Now, it’s routine for a ship’s entire crew, from captain to custodian, to be responsible for helping during an emergency. 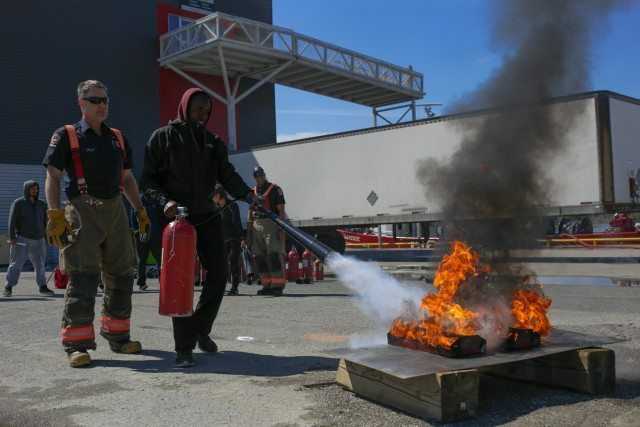 City of Toronto and emergency medical services employees conduct this training program to teach cruise ship workers to spot signs of danger, how to report them, and to be safe when things go wrong. This year marks the 20th anniversary of the program’s inception, which covers most basic marine emergency duties—from firefighting drills and evacuation protocol to first aid and pollution control. Employees also undergo individual training on their respective ships, which is logged with Transport Canada. “What we’re trying to teach is professionalism: know what your duties are, be able to control your passengers, and be able to help your passengers get off the ship if necessary,” says Angus Armstrong, Toronto Ports’ chief of security for 13 years and harbour master for 12. Gaining those skills is key to Faye Adriano, a new bartender for the 290-passenger Yankee Lady. A group of 32 pile on one at a time into a 45-person life raft. And there’s no better way to understand emergency protocol than to enact a dangerous situation. All day, the trainees underwent mock emergency trials. At one point, a 45-person life raft clung to the side of the Empress of Canada with more than 30 students in its bed, each with self-taught, properly secured life jackets. Volunteers in exposure suits took the plunge to learn and show their peers how to board a life raft after submersion. Trainees then learned how to extinguish fires on the water, haul in overboard passengers on ring buoys, and identify and report potential environmental infractions—all in the name of keeping passengers safe and sound as they ride Lake Ontario’s waves.